Dr. Restituyo received his medical degree from Universidad Nacional Pedro Henriquez in the Dominican Republic. 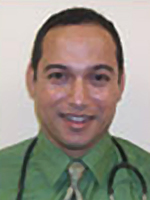 He completed his residency in Internal Medicine at SUNY Downstate Medical Center in Brooklyn, N.Y., followed by a Fellowship in Geriatric Medicine at St. Luke’s –Roosevelt Hospital Center, Columbia University College of Physicians & Surgeons in New York. Dr. Restituyo is board certified in Internal Medicine and Geriatrics. He was Assistant Professor of Histology in the Dominican Republic and Clinical Assistant Instructor at SUNY Downstate Medical Center. Dr. Restituyo is located at our Greater New Bedford Community Health Center, Inc. practice.